Our International Convention was held in Denver this summer hosted by West Central and Pacific Northwest Provinces. We meet only every three years – so this was a special opportunity to enjoy music with our fraternity brothers and sisters, hear some interesting workshop speakers, do our organization’s business and have fun. All Mu Phi Epsilon members are welcomed at a Convention. Non-delegate members are invited to attend sessions, meals and concerts. Convention photos with Jenny Smith and Rosemary Ames modeling the "Fun" glasses. 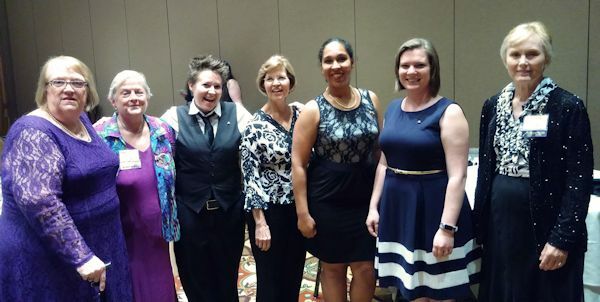 Our South Central 2 Province includes several collegiate chapters plus Dallas, Austin, Denton and San Antonio Alumni chapters. The Mu Phi Epsilon International Competition is held tri-annually in conjunction with our Convention and is sponsored by the Mu Phi Epsilon Foundation. The Foundation is the non-profit philanthropic arm of Mu Phi Epsilon and awards many scholarships, awards and grants every year. (See www.MPEFoundation.org). The winner of the International Competition receives the opportunity to be presented in concerts and recitals by chapters of MPE for two years with their expenses paid and $200 per appearance. Each finalist also receives $500. 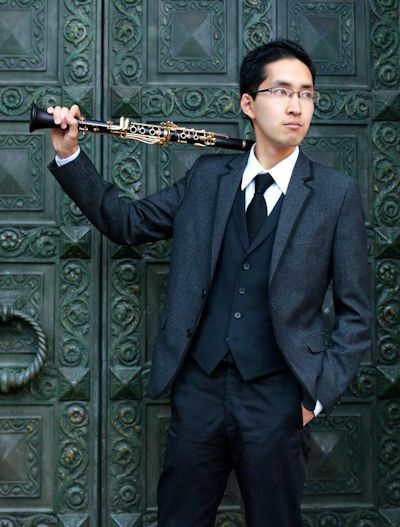 The 2017 winner was Katsuya Yuaso, a fine soloist and chamber musician and Yamaha Young Performing Artist in 2014. He is Adjunct Professor at Florida A&M University, and a graduate teaching assistant at Florida State University where he is pursuing a doctoral degree. He was a Phi Mu member and is now an Allied member. He presented a full concert during the Convention. Our chapter will be considering ways to bring Katsuya here for a performance during the next two years. You won’t want to miss him! The conference will begin at the Union in a ballroom for the opening speaker and lunch and then move to the music building. Parking is across the street at the practice building. The day will run from about 10:30 am to 7 pm and include a social hour, lunch, keynote speaker, three wonderful sessions, and a recital. It will be a GREAT opportunity to build relationships with our future alumni members, as well as learn and collaborate about various aspects of Mu Phi Epsilon. The host chapter is working really hard to create a wonderful convention for all of us. Jordan Doss, the UNT president, has asked for some alumni input: what kinds of sessions do you feel would benefit you the most? What do you want to learn about or have a discussion about? The current sessions include Resume Building/Job interviews, group discussions pertaining to each pillar (Music, Friendship, Harmony), Mu Phi After Graduation, and a panel for performance/teaching careers. Any and all ideas you have are appreciated! Below you find the link to register for District Conference which will take place on March 24th at UNT. The cost is $25 which includes a Tshirt, lunch, and a goodie bag. The link will be open until March 1. This message is from the host chapter: "PLEASE uncheck the box on the PayPal. Otherwise, we will not collect all money we need. Thank you!" with the check made out to Mu Phi Epsilon." Please still fill out the online form and let me know if you’ve chosen to send a check instead so I can let the host know. Go ahead and check the box that says you’ve paid as well. Please let Ashley know if you have any questions! Dallas Alumni Chapter is part of the South Central 2 District. When Mu Phi Epsilon was founded almost 105 years ago on November 13th, 1903, at the Metropolitan College of Music in the uptown Mt. Auburn neighborhood of Cincinnati, Ohio, the 13 women who were its charter members chose the violet as the new fraternity’s official flower. It was not unusual for a fraternal organization to choose a flower as a symbol (another music fraternity founded that same year has the red American Beauty rose as its symbol), but nobody seems to know exactly why our founders chose the violet. Perhaps it was merely that it is a well known flower whose very name is synonymous with purple, the royal hue that had been chosen as Mu Phi Epsilon’s color. But the violet seems an unlikely symbol for the kind of bold endeavor in which those 13 women under the pioneering leadership of Elizabeth Mathias Fuqua were engaged. Indeed, our American English includes the slang phrase, “shrinking violet” to describe a person who hangs back, withdraws from involvement with others, avoids shining in the public eye, is over-cautious and uncommitted. Hardly an image for a group that includes the electrifying Ruslan Biryukov and Mary Au, or the pioneering Dr. Frances Kinne, or even “Dr. Indiana Marcus Jones” and his intrepid seekers of the Onyx Circle. We musicians also are familiar with an image of the violet presented in “Das Veilchen,” one of Mozart’s most famous songs, in which Goethe’s poem tells of “ein herzigs Veilchen” (a lovable little violet) that is simply delighted to be trampled to death by a passing shepherdess it happens to think is dreamy. It actually rejoices at its own destruction at the hands (or rather, in this case, the clod-hopping feet) of the indifferent object of its affections. Goethe may have called that lovable, but the next century invented a new word for that sort of thing: masochistic. Again, not exactly a desirable role model. Yet despite all that, of all our fraternity symbols the violet is the one I find most inspiring and most appropriate. It exemplifies exactly what I think Mu Phi Epsilon and its members should be. To explain why, perhaps we need a short botany lesson. To begin with, the scientific name of the violet is Viola odorata—and what other flower shares its name with a musical instrument? (One which also, by the way, is frequently overlooked in favor of flashier neighbors but has a rich charm of its own.) Music is our first ideal, and it is suggested even in our mascot flower. Next, violets have many traits that we in Mu Phi Epsilon value and wish to emulate. The botanical family Violaceae is one of the most wide-spread of flower families. There are over 1000 species. Examples are found on all the world’s continents except Antarctica. There are violet species in the Americas, in Europe, across Asia, in Africa, in Australia and Polynesia. They’re found in tropical rainforests, on Andean mountain slopes, in the Australian bush, in European meadows, and in Georgia woodlands. Mu Phi Epsilon hasn’t yet reached that level of international distribution, but what a goal to which to aspire in our second century! And violets are diverse. Despite the stereotype associated with the name, not all violets are purple. Some really are blue, like in the old rhyme. Others are reddish, or pink, or yellow, or white, or green, or buff, or just about any color except true black. Members of the Viola family come in more different colors than any other flower family, including those roses. Not only that, but they come in all different shapes and sizes, too. Very many of the Violaceae are the small perennial herbs we think of when someone says, “violet,” but the worldwide family also includes larger plants, some shrubs and even a few trees. Mu Phi Epsilon, too, has always been a leader in diversity. By decades, we were the first professional music fraternity to become co-educational, and our 30-year history of welcoming the talents and contributions of both female and male members on an equal footing has immeasurably enriched our fraternal bond; we certainly are the only music fraternity with gender parity among its Executive Board’s elected officers, which now consist of 3 women and 3 men. Even earlier, Mu Phi Epsilon welcomed as collegiate members musicians like Ruth Watanabe and Shirley Verrett (who later became, respectively, the eminent musicologist who oversaw the world-famous Sibley Music Library at the Eastman School of Music and one of the world’s greatest opera singers) at a time in American history when Ruth’s family was being removed from their home on the West Coast and shipped off to internment camps by their own government because of their ethnic heritage and when Shirley’s family were forced to leave their home in the South to escape legal discrimination which saw only the color of their skin. Mu Phi Epsilon, however, looked at these women and saw only the content of their character and the depth of their talent. Even the act of Mu Phi Epsilon’s founding by women in 1903, 17 years before any of them ever would be entitled to vote in a presidential election like this year’s, was a direct challenge to doors that were closed to capable musicians because of who they were, not what they could do. For its entire existence, Mu Phi Epsilon has stood proudly for increasing the diversity, violet-like, within the family of musicians. And just as the violet family includes herbaceous and woody flowers, shrubs, trees, and just about every kind of plant form, Mu Phi Epsilon includes just about every kind of musician. We are not just performers or just music teachers or just composers; we are all of that—and much more. We are music therapists, music businesspeople, musicologists and arts administrators and music engineers; we are classical musicians, jazz musicians, commercial-format musicians, and world musicians. And most meaningful of all to me, as our fraternity’s Alumni Advisor, we in Mu Phi Epsilon are truly diverse in age and experience. We are the fresh-faced, eager (and sometimes puzzled) students just starting our lifetime engagement with music, like those who so beautifully offered our table grace; we are the aspiring young artists, “paying our dues” as our careers are launched that Erie Mills talked about yesterday; we are busy professionals in the hectic midst of active careers, like many of our presenters throughout this convention, and we are wise, experienced hands like our keynote speaker, Dr. Frances Kinne, watching with interest and often aiding the rise of those next generations to whom we will pass on the torch. 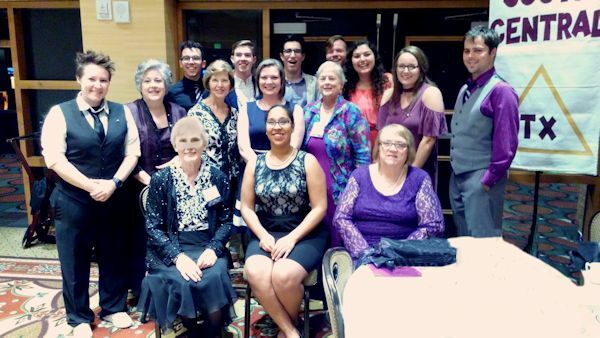 And all of us are resources for each other, resources of Music, of Friendship, and of Harmony, as long as we continue to be active, engaged participants in the network of collegiate and alumni chapters or Allied Members. When I was growing up in Oregon, violets were the first sign of spring. Before the daffodils, before the forsythia, before the crocus, in the dead of January, sometimes even before the snow had completely melted from all the shadier spots, violets were poking their heads up and starting to bloom—they were determined, tenacious, and tough. They were way out ahead of the curve—long before my grandmother’s garden was a riot of spring flowers, the violets had been soldiering on, doing the work of bringing color and perfume to the yard, for a good two months. And even once the flashier flowers started stealing attention and getting more of the oohs and aahs (and my late grandmother’s garden got a lot of those), the violets kept right on blooming: March, April, May, June…. Like Horton the Elephant, a violet’s faithful, one hundred per cent. And we in Mu Phi Epsilon likewise treasure faithful loyalty. Another trait violets have that should inspire Mu Phis is that they spread—rapidly, and by whatever means possible. Several gardening books I’ve read even use the word “invasive” to describe them. Violets stop at nothing to increase their numbers. They spread by runners underground, they spread by dividing, they spread by self-sown seeds, and, if there aren’t sufficient insects to pollinate them, then they will send up specialized flowers that don’t ever open and pollinate themselves to make seeds that way. Violets are passionately devoted to perpetuating and disseminating themselves, and every Mu Phi member and chapter should be, too. And, if you can say this about a plant, violets are smart—they’re adaptable; they know how to change. Violets often invasively spread into lawns—and once established, they’re almost impossible to get rid of (another trait that Mu Phis would do well to emulate). And if violets growing in a lawn have all their long-stemmed flowers mown off, the same plants will almost immediately send up a new crop of flowers on little short stems that will survive the next mowing. Responding to changing circumstances by changing itself, its bylaws, its operations, and its traditions has been one of Mu Phi Epsilon’s great strengths over its first century, and it is a trait we will need to keep if we are to have a Bicentennial Convention in 2103. Finally, violets are the friendliest, most helpful and giving flowers around. Viola odorata is a highly useful plant. It’s completely edible. Its leaves can be used as salad greens and its flowers as edible garnishes. (I hope you noticed the violets on your salad this afternoon and have taken the opportunity to make violets, as Dr. Kinne might say, part of your DNA.) When cooked, the leaves can be used to thicken soups (giving the plant the nickname of “wild okra” in some parts of the USA). The flowers are often candied and used to decorate desserts and are considered quite a delicacy. People in earlier times used violets for a number of medicinal purposes. And then there’s the perfume. Whole field of violets go into some of the rarest and most expensive perfumes in the world, and one little bloom of Viola odorata can fill a whole room with wonderful fragrance. Ounce for ounce, it’s far more powerful than that American Beauty rose, but the friendly violet will never stab you in the thumb with its thorns. That’s true Harmony, and if each member of Mu Phi Epsilon will look to the violet for inspiration, sweet perfume will scent our thorny paths (as the original words of “Our Triangle” read) and fill a whole world with Music, Friendship, and Harmony.